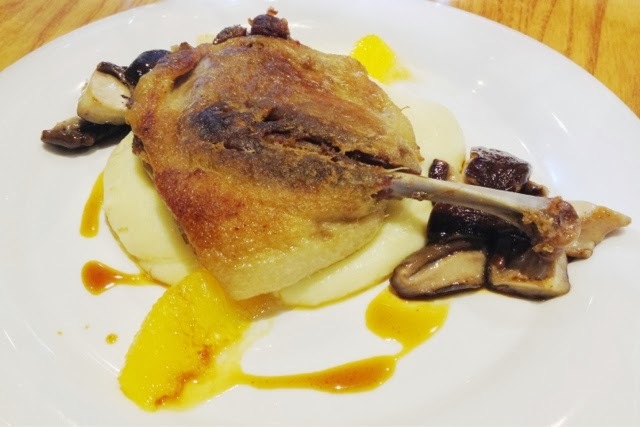 Saveur's mission is to serve French gastronomic cuisine for the general crowd, that is, French cuisine for all at an affordable price. Last two week before I started working, I had a Monday lunch with a friend who came to visit for a week. I have been hearing of good reviews about Saveur and suggested that we should give it a try. There are two outlets in Singapore: Purvis street and Far East Plaza. We went to Far East Plaza. The restaurant was located on the first floor (street level) of the building, and entrance to the restaurant is accessible from the outside. Upon entering the restaurant, I had a view of the entire dining room located a short stairway below me. There is nothing fancy about the place, casually and closely spaced tables with dimmed blue-tone lighting. I would say there's nothing French at all about the deco. I ordered the Saveur's Pasta ($4.90) for the starter and the Duck Confit ($12.90) for the main course. 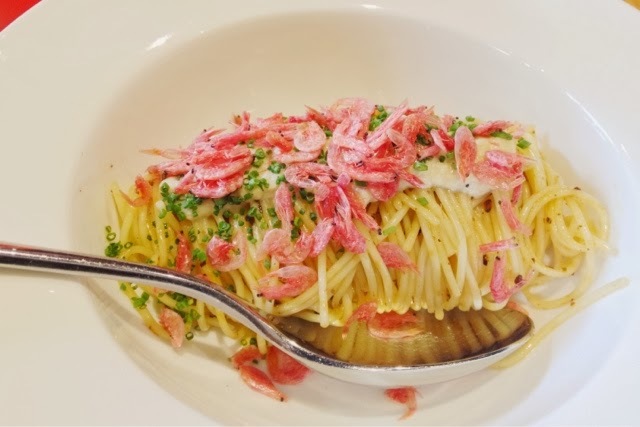 The Saveur's Pasta is essentially angel hair pasta with mince pork sauce and chili oil, topped with sakura ebi (crispy dried shrimp) and japanese konbu (kelp). Angel hair pasta has been very popular recently in the "fine" dining context in Singapore. Talk about Gunther's cold angel hair pasta which my favorite is with parma ham, tomato, and mozarella. Or Iggy's angel hair pasta (that I never tried) which I believe was an inspiration for this dish (also Gunther's hot angel hair pasta). To be frank I am not a big fan of this dish. It was just fine. The sauce was too oily with no pork taste, and the sakura ebi doesn't taste like ebi at all. On the other hand, I think my Duck Confit was really nice. Underneath the duck was a pond of mashed potato and sauteed shitake mushrooms. The duck skin was crisp and fragrant. The duck flesh was juicy and well seasoned, although just slighthly on the tougher side. The star of the dish would be the orange segments and the orange infused au jus. The orange added perfect amount of sweetness and acidity to the dish. Without the oranges, I feel that everything will taste ordinary. My experience at Saveur was pleasant. I would definitely return for the duck confit. And also, where else you could expect for French mains and starters under $15.